From the EverQuest II manual: Those who seek to dominate their foes, subjugating an enemy's will to their own, will find the Coercer to their liking. The Coercer serves a party best behind the front lines. They can subdue multiple opponents, send enemies fleeing in induced unbridled terror, and even seize control of minds. 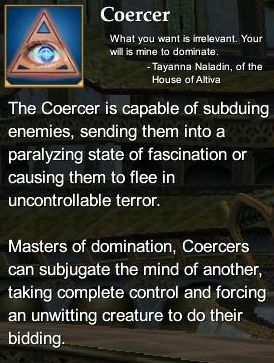 A Coercer can also mentally augment their allies, improving their abilities in combat. The Coercer wears cloth armor and can use staves, wands, and daggers as weapons. This page last modified 2011-08-25 22:54:57.